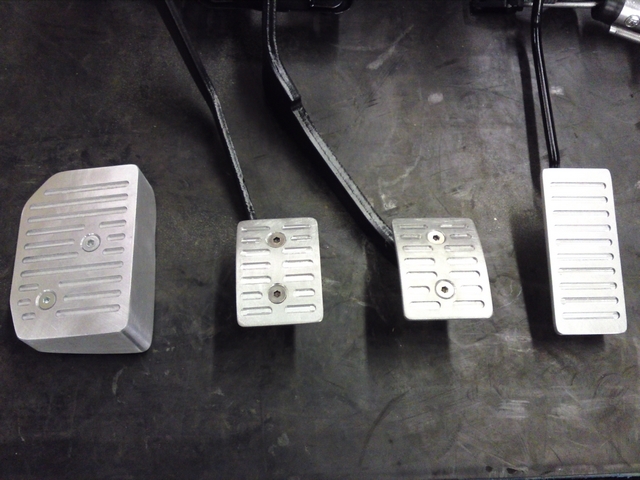 I had already refurbished the pedals for the Corolla and had to remove the rubber boots that are on there so the pedals could be sandblasted and painted. But those rubber pedal boots were already pretty worn and to be honest, they weren't really nice. I should be able to come up with something better for that. 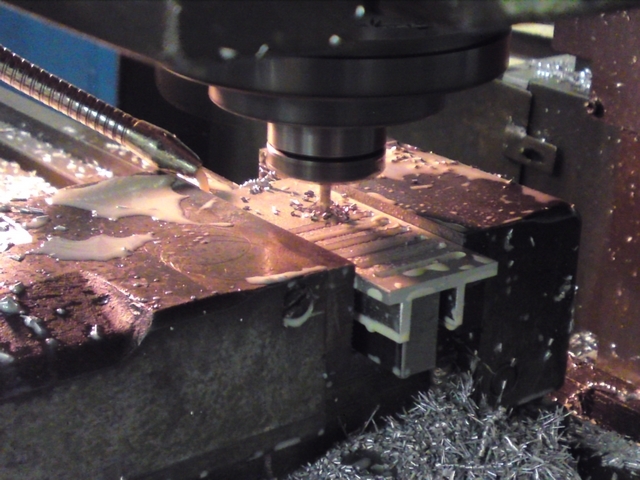 And again, there are more than enough aftermarket off the shelf solutions for that. Pedals in all different shapes, sizes and colors, but often enough, the fitment of those are a bit dubious. 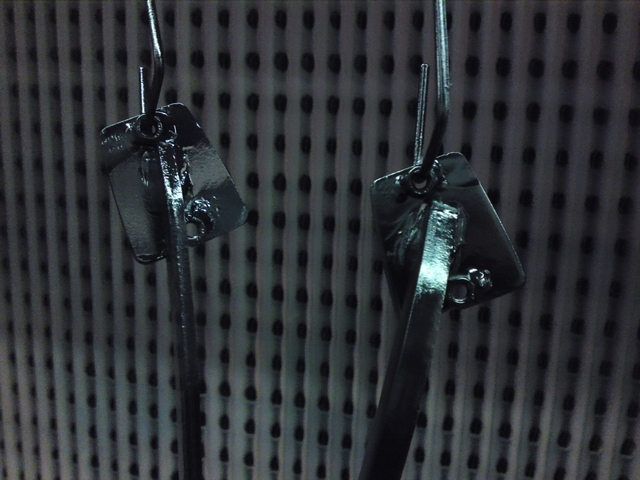 Often enough, they are just clamped down over the original pedals. Not quite nice and durable if you ask me. I wanted something a bit more sturdy and durable. 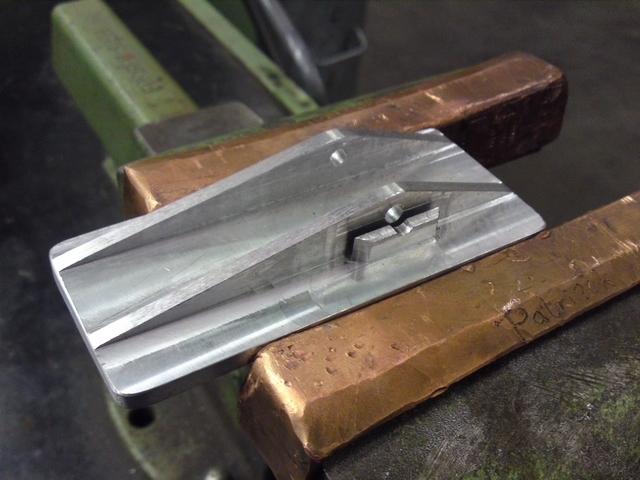 Things were pretty slow at work and the guys from the machining department were struggling to keep themselves busy. So I asked them if they wanted to help me out on a little project. 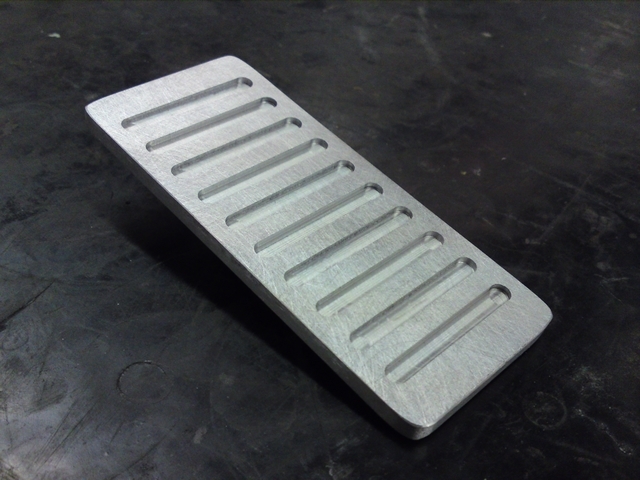 We had some 4mm thick aluminum sheet laying around I could use a little from, should be good enough for making some pedals. All I had to do now is figure out what I wanted them to look like. I didn't want anything flashy or special, but I wanted them to look clean and solid. 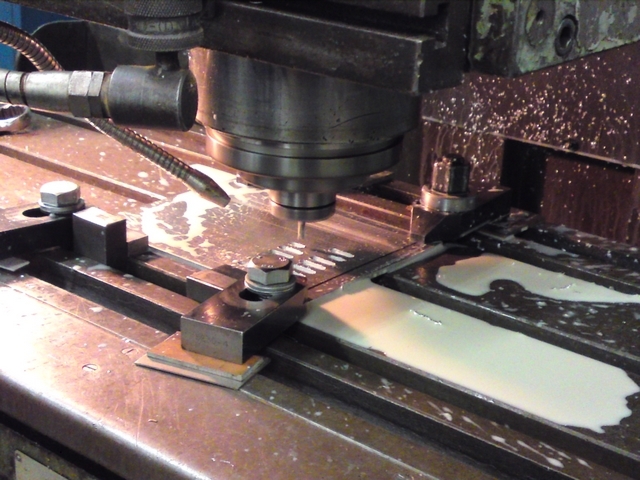 So I discussed what we could do with the guys that would have to make them with the machines we had in the workshop. 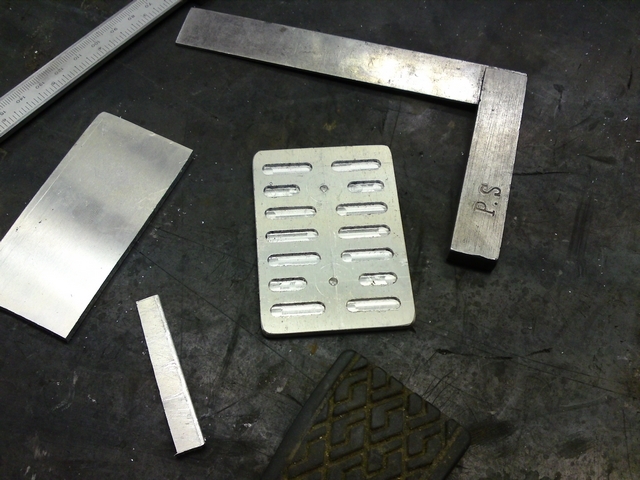 We thought up a little simple design and they would try to fabricate them for me on the milling machine. To be able to securely fasten the pedals to the pedal base, I drilled two holes in the pedal base and welded a couple of M6 nuts behind them. Now I had something I could screw the new pedals to. I was going to use 2 countersunk bolts to bolt the pedals to the pedal base. 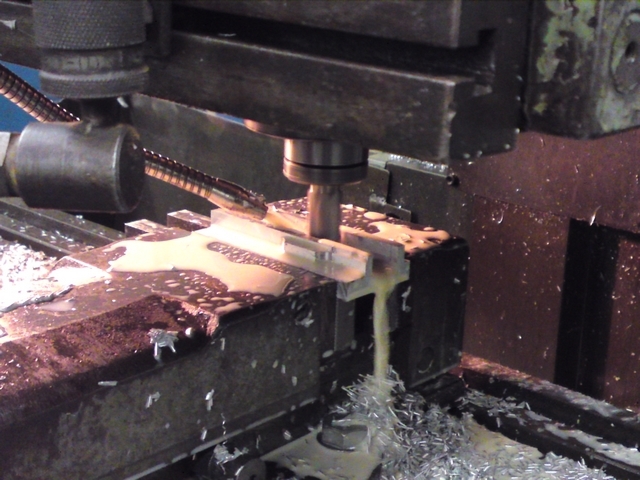 So I drilled two holes in the pedals (which we had already incorporated into the design) and drilled them with a countersink drill as well. I think polished aluminum pedals aren't going to work for long. With dirt, gravel or sand under your shoes you'll scratch them up in no time. So I decided to go for a brushed aluminum look so scratches etc. wouldn't stand out that much. I had some self-adhesive sanding paper and stuck that to a piece of glass. By rubbing the pedals over this sandpaper they got that brushed look. Afterwards I made a little curvature in the pedals to make them easier to use. I used countersunk stainless steel Allen bolts to bolt the pedals to the pedal base. 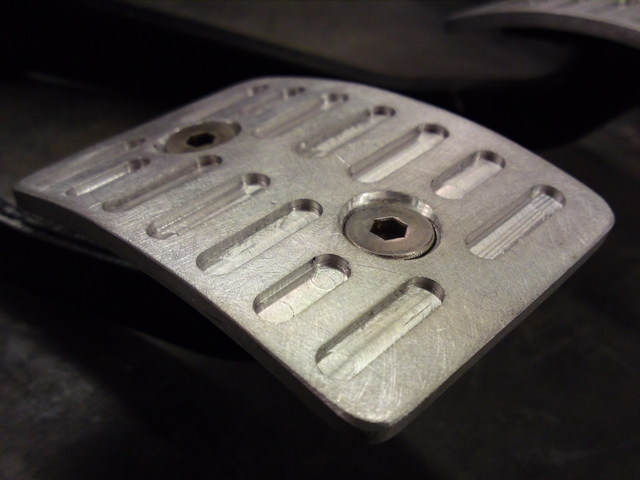 They are sunk under the pedal surface, so they are not in the way and fit the design of the pedals nicely. Well, that took care of the brake and clutch pedal. Put it would look really silly if I was going to use the black plastic gas pedal with these nice new pedals. 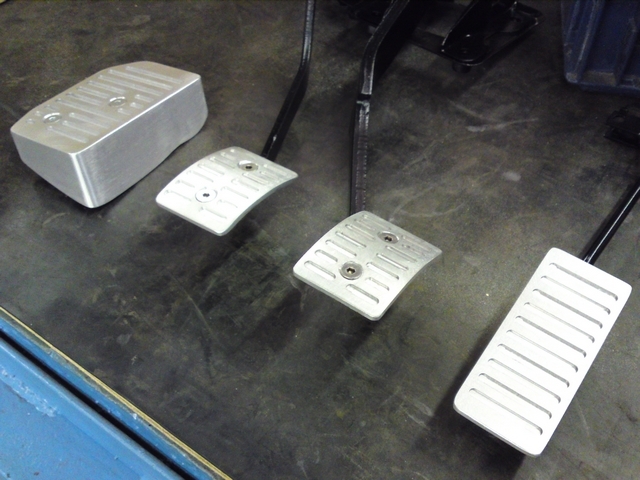 So we had to make a new gas pedal that would compliment the other two pedals. 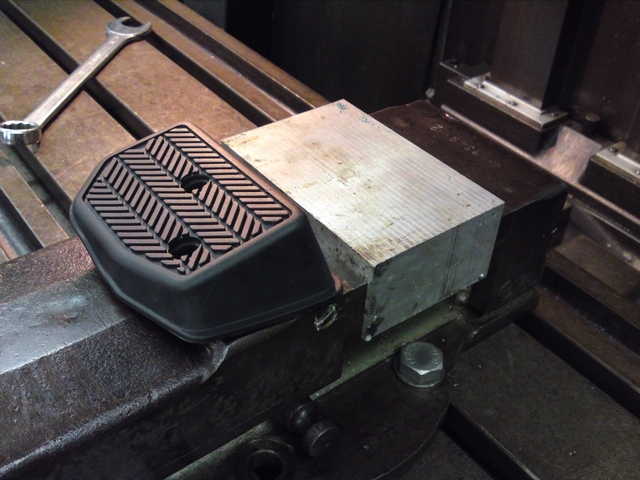 But the gas pedal was not as easy to make fabricate as the other two pedals. 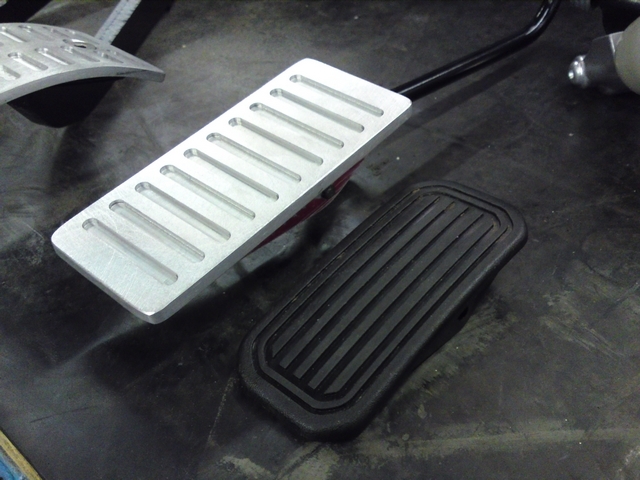 The gas pedal doesn't have a rubber boot but is a solid plastic pedal that also has a few parts for it's mounting integrated into it. 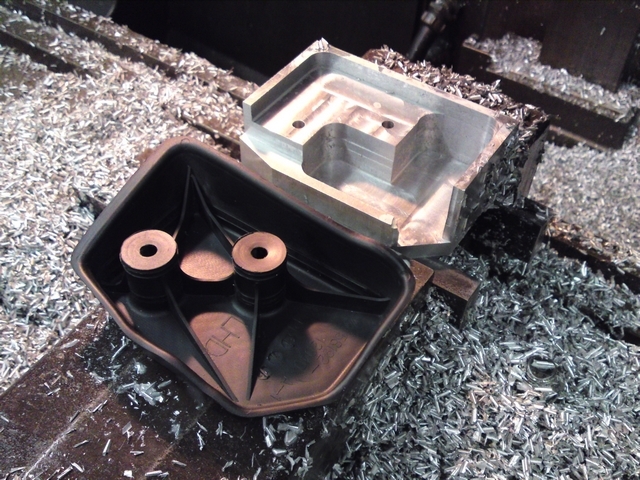 But after looking it over with the machining guys they figured they could reproduce those as well into a new aluminum pedal. But this wouldn't be made from a slab of aluminum, but from a solid piece. 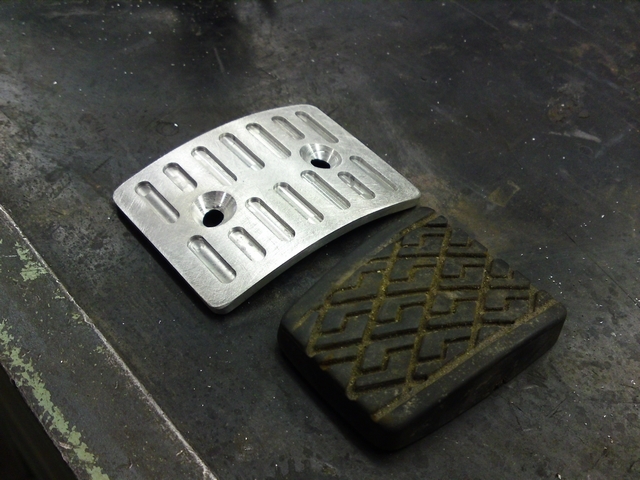 The old plastic pedal and the solid piece of aluminum from which the new pedal will be fabricated. 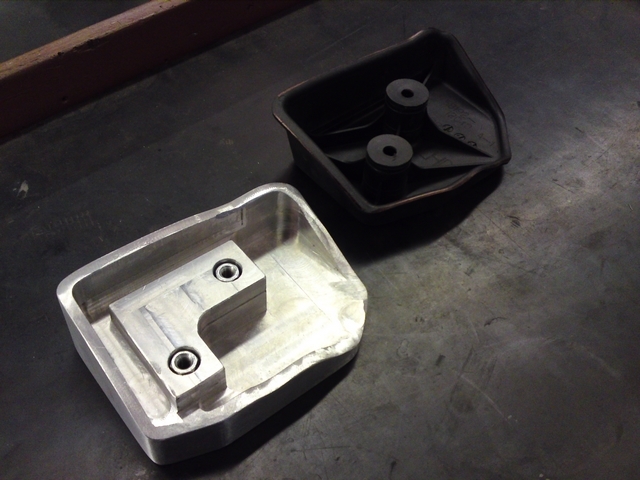 Those guys went at it again with the milling machine and after a few hours, I had a nice copy in my hands that fitted the original pedal base perfectly! That looks a whole lot nicer than that piece of plastic and it compliments the other new pedals. But we weren't completely there yet. I had a new set of pedals, but next to those pedals there is a foot rest. It would be a crying shame if I were to install 3 great new pedals and have that big block of plastic next to it. 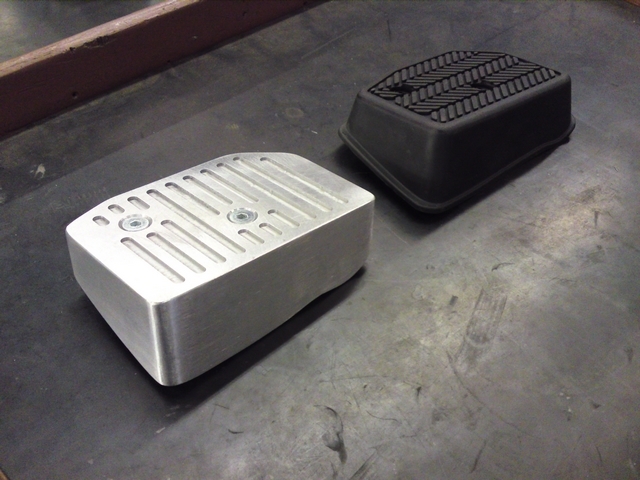 So we had a look at the original plastic footrest to see if we could fabricate something similar. It would take another solid piece of aluminum, but we figured it could be done. It had pretty complex curvatures which could not be duplicated with the old analog machines we had at our disposal. But they would have to be replicated as those shapes join up with the shape of the car's bodywork. 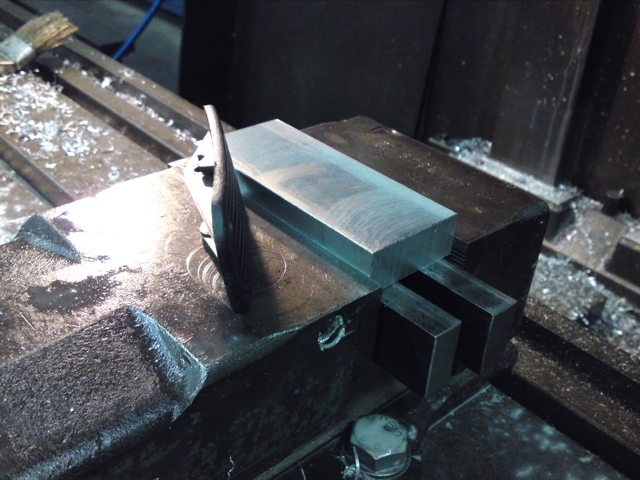 But if we'd leave some excess material on the edges, I could trim them down to shape. 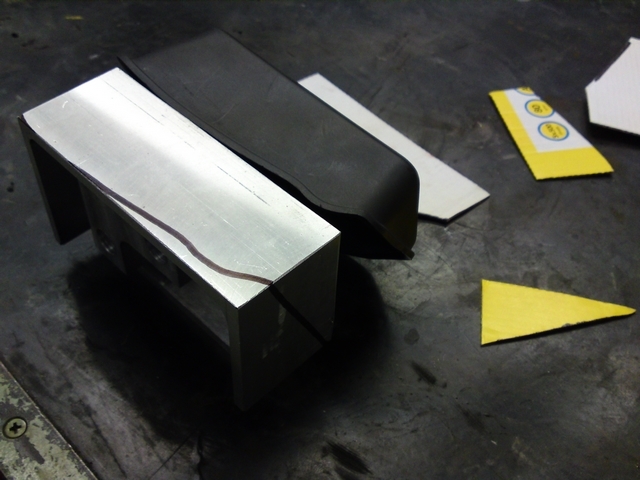 With a piece of cardboard, I traced out the curvatures of the original footrest to replicated them on the new aluminum one. Now I had a complete set and the end result looked perfect! Way better than the original pieces of rubber and plastic if you ask me!